A documentary about an interesting situation that unfortunately is completely one-sided and never gets into any real debate. This is a movie about fracking and how the people who do it end up contaminating the water supply of the people who live in the area. it’s a pretty one-noted film and that one note is simply how terrible it is that this is being done. destroying the water supply is destroying the way of life that some of these people lead. many of them are farmers with animals who need drinking water. all of that is interesting, but the problem with the movie is that it only shows things from one side of the argument. we don’t really get to hear from the people doing the fracking, and a major issue that the movie doesn’t address is that these people who are complaining actually agreed to let the fracking happen and were paid for the use of their land. the movie isn’t very good simply because it never goes anywhere past it’s initial ideas. Gasland is about fracking. if it were more about fracking and the process and why the government is doing it, this could have been a far better film. instead, the movie is really about how terrible the government is because they are destroying the water supply of the people who live on this land. it’s basically a one-note film, about how corrupt and mischievous the big brother organization is, and that’s all fine, but in order to make it interesting, there really needed to be another side to the story. there needed to be something that was up for debate. at the start of the movie we learn that the narrator, josh fox, just had a visit from the people who want to drill into his land to look for natural gas. they want to offer him a total of four hundred thousand dollars. instead of accepting it, the same way most people in the area do, josh decides to take a trip around his area and speak to some of his neighbors. he wants to know their stories and what happened to them after they accepted the money. what he finds is pretty much the same story, over and over again. the drinking water became contaminated. in some cases, the water pretty much turned black. this is the water that now comes out of the people’s faucets. 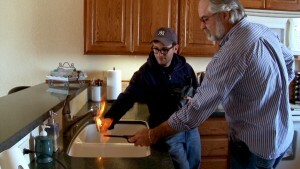 in other cases, the water is now filled with so much gas and other carthinogenic materials, that it can be lit on fire. the tagline for this movie is, “can you light your water on fire?” and that seems to be the big image of the film. in fact, we get to see two different scenes of water being lit on fire. while it is a somewhat interesting image, it is hardly enough to base a movie around. josh continues to travel west and really just finds more of the same. the only people he really interviews for the first three quarters of the film, are people who live on these farms and are dealing with this. we hear stories about them of how they would approach the people who were doing the fracking, and ask them what kinds of materials theye were putting into the ground, and how these people weren’t even sure themselves. instead of hearing the nieghbors tell this story, and basically hearing a biased account of what happened, the movie would have been much better if josh actually went to the people doing the fracking himself, and asked those questions. the problem is that the other side isn’t really given the opportunity to defend itself. now, i’m not saying that any of this fracking is right, or that it’s okay that the drinking water was contaminated, but what i’m saying is that there is more to the story than the movie is showing. for exmple, a bigger deal should have been made of the idea that the government is paying people so much money. it’s a huge amount, to the point where these people could easily uproot themselves and move somewhere else where they could buy a bigger home. now, of course, the people shouldn’t have to do this, and it should be their choice, but a question that the movie doesn’t really ask enough about, is why are these people acceoting the money? if they are so against the process and what it is doing to their land, then maybe their argument would be stronger if they weren’t agreeing to get paid for something, only to complain about how terrible it is afterwards. maybe their argument is that they didn’t know this was going to happen to the water supply, but there just isn’t enough made about the money that is being offered. it is mentioned in the beginning and then pretty much never again. another thing the movie doesn’t do is really explain the reasons why hydro-fracking (hydraullic facturing) are important. maybe it’s obvious that we need oil and gas and don’t want to rely on foreign countries to have to provide these to us, but the movie never goes anywhere near making that case. it basically doesn’t give the other side a chance to present itself, and therefore never really offers a debate of any kind. this was an opportunity for the film to be incredibly educational, the way a good documentary should be, and instead became just a forum for people to go on rants and complain. in the second half of the movie, leading up to the ending, we finally start to get some interviews with people who are on the other side. the interviews aren’t very good, and seem to be cut in a way that allows the fimmaker to manipulate what we are thinking, but at least this is better than just spending the entire movie talking to neighbors. the first person josh interviews who actually has something new to offer is a man who works for the environment protection agency and claims that he wants to pay people to fix their problems. he talks about fresh water tankers that his company has bought and given to certain residents who really did have the problem with their water supply. josh seems to be making the case that the few water tankers that were purchased are not nearly enough. then, at the end of the movie, we watch a hearing where the speaker who sits behind a podium, like a judge, basically doesn’t let the fracking companies speak at all. she is very demanding with her questions, driving them hard to get the exact answers she wants. between her abrasive line of questioning and josh the filmmaker cutting this movie in the specific ways that he wants in order to show something, there is no question that this movie is manipulative and almost like propoganda. i still believe that fracking and destroying a water supply is wrong, but the feeling of being pushed too hard to agree with this argument really just made me want to see what the other side had to say about it. 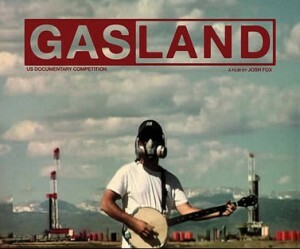 gasland is a movie based on an interesting and very relevant topic that just doesn’t go nearly as deep as it should. this movie could have really gotten into fracking, showing how it started and where the idea came from. instead, it spends pretty much the entire movie talking about how terrible it is and how awful the people are who are doing this. most of the movie seems to be about the water supply being contaminated, and while that is a pretty bad situation, it’s not really enough for an entire film to maintain our interest. i plan to watch the matt damon movie promised land, about this topic, soon. something tells me that movie will be much more about showing both sides of the argument. if this is true, then it is kind of ridiculous that the better depiction of a real life situation comes from a fictional movie than from a documentary.